Do heart attack, congestive heart failure, and heart disease seem like frightening medical terms? Do you suspect your canine might have a similar cardiac condition? Even though dogs don’t experience heart attacks the same as humans, it doesn’t mean they can’t die from it. Considering cardiovascular disorders are common in pooches, the pet owners should focus on breeding and nutrition. In this post, we will discuss possible causes and prevention, as well as review the best dog food for congestive heart failure. The combination of veterinary procedures and treatments with the proper diet, will not only improve your pet’s health but also add years to his life. Hill’s Prescription Diet is a dry food dog recipe formulated for canines with heart disorders, such as CHF. It features over the top ingredients which promote the cardiovascular system, and for that reason, it takes the first place on our list. Your vet may recommend this meal as an early-stage treatment plan. Based on your pet’s diagnosis, Hill’s Prescription Diet will cover all nutritional needs. Dogs suffering from congestive heart failure, or so-called CHR, tend to retain fluid. It is a common symptom that follows this condition. Additionally, it can affect your pet’s performance and decrease organ functions. This meal is low in sodium and chlorine which will reduce the fluids in your pet. Also, sodium intake promotes healthy blood pressure. Hill’s prescription meal uses corn-based proteins. They are combined with animal-based proteins which are essential features for CHF. On top of that taurine and L-carnitine will ensure proper function of the cardiovascular system. Overall, if you want to keep your pet healthy, then Hill’s prescription recipe is one of the best choices you can make. Royal Canin has been in the pet care industry for decades, and this brand formulates diet which targets specific health conditions in canines. In case of Early Cardiac recipe, your pet might not get the lowest sodium content, but instead of that, an adjusted version for canines with mild to moderate restrictions. This meal will be an excellent choice for an early stage of the disease. It should serve your dog as a preventive and minimize the progression of cardiovascular disorders. Royal Canine is packed with plenty of vitamin B. In most cases, medications used for congestive heart failure deplete the pooch of vitamin B. However, this nutrition will improve your pet’s energy levels and boost his immune system. To conclude, the carefully selected set of components will promote health in your canine and it’s an excellent dog food for heart murmur. Wellness is without a doubt one of the biggest manufacturers of dog food around the world. Their Complete Health line was designed to accommodate canines’ health issues and help them recover. This recipe supplies your pet with all-natural ingredients combined with high-quality proteins, like lamb meat. On the other hand, a healthy dose of fruits and vegetables will fuel his body with much-needed energy. We should mention a couple of components such as Chicory Root and Yucca Schidigera. The first one protects the body against worms, while the second one maintains proper digestive functions. Wellness Complete Health doesn’t contain artificial additives, corn, wheat, or soy. Additionally, taurine stimulates a healthy heart. Considering this meal is ideals for the adult dogs, supplement such as Chondroitin Sulfate will take care of his joints. In summary, dealing with an adult canine can be a challenging task. But, if you apply the right nutrition, everything becomes easy. Optimal nutrition is crucial to balance the body functions and keep your pet in shape. Fortunately, Purina Pro Plan combines premium ingredients to ensure overall health and offer your pet enough energy. 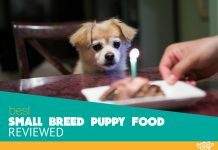 This recipe contains low sodium, phosphorus, and protein content, which stimulate the kidneys and help dogs feel better. On the other hand, the Purina Pro Plan has a lot of dietary benefits that provide optimal nutrition. It will fulfill the nutritional needs of your pet and help him stay active. Even though this meal features a balanced set of components; it’s mostly focused on kidney diseases. It can minimize the symptoms of kidney failure and slow down the progress of the disease. In all, the Purina Pro Plan delicious meal will keep your pet sated, while protecting his entire body. Whole grains are hard to find in dog food lineups, considering the current trend to get rid of the grains in recipes. However, the Honest Kitchen’s Whole Grain formula promises to use only the healthiest ingredients, as well as the highly nutritious grains available. The proteins are sourced from the ranch-raised beef, while other components come from organic farms. In this case, Honest Kitchen’s meal features low protein and fat content which makes it a perfect solution for obese dogs. It will keep their weight under control and help with weight loss. On top of that, this food contains zero additives, by-products, or GMO components. The preparation process is quite easy and takes only a couple of minutes. You just mix the food with warm water and serve it to your pet. 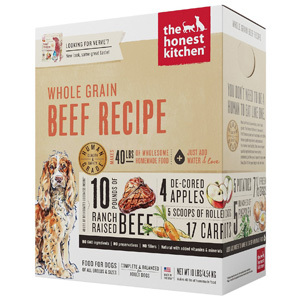 The bottom line, if you want to embrace organic and all natural nutrition for your dog, then the Honest Kitchen’s Whole Grain should be your next pick. Congestive heart failure is linked to the heart’s inability to pump the blood properly through the rest of the body. As a result, blood stays in the lungs, while fluids accumulate, which further obstructs both, the lungs and heart. However, this is more a condition than a disease and occurs in a pet who suffers from a severe heart disorder. When the fluids accumulate in lungs, it prevents your pet from breathing normally. This condition also enables oxygen from moving into the bloodstream. You may notice your dog taking shallow and rapid breaths to get enough air. Additionally, a canine with fluid in his lungs may not be able to exercise, may experience cough, and may appear weak. The right-sided CHF causes an insufficient venous return to the heart. To make it simple, when the heart pumps the blood, instead of pushing it through lungs to enable oxygenation, some of it leaks through the tricuspid valve. Over time, this blood accumulates in the abdomen and interferes with the function of other organs. Fluids may fill the stomach as well, causing the swelling. In case of the left-sided CHF, heart pumps blood into systemic circulation instead of the left ventricle. Some may go through the mitral valve, returning into the left atrium and packing up into the lungs. Later on, the fluids can reach the lung tissue and cause pulmonary edema. Signs such as coughing and obstructed breathing should indicate the left-sided congestive heart failure. Cough is a common sign of severe heart disease in canines. On the other hand, coughing might indicate your pet has respiratory issues as well. You will notice coughing after excessive exercise, during the night, or may occur throughout the day. If you see similar symptoms take your pooch to the vet. He may gently squeeze his trachea to make a proper diagnosis. Obstructed breathing is another indicator your canine might experience cardiovascular issues. Unlike humans, the animal can’t tell us what’s wrong with them. So, you need to recognize the signs to improve their health condition. A pooch who experiences impaired breathing may try to catch more air. As a result, you will notice rapid breathing patterns, while the neck is frequently outstretched. Many dogs will be reluctant to lie down because it’s harder for them to breathe in that position. Since the heart is unable to pump enough blood and transfer oxygen throughout the bloodstream, your pet may experience fatigue. He might show signs of weakness and may be reluctant to exercise and engage in everyday activities. Be sure ask for vet’s help if you notice additional symptoms. Reduced stamina and inability to exercise are occasional complaints about pets with heart diseases. Since some animals will avoid regular activities, noting a decreased ability to move might be tough. However, canines with CHF are often sensitive to hot and humid days and may display shallow breathing. Pay attention to his behavior and don’t mistake this for normal panting. The loss of appetite is quite common in dogs with cardiovascular issues. Pet parents may notice the reduced food intake, as well as a change in feeding schedule. This may be the result of worsening heart disease, side-effects of medications, or hormonal disorder. There are certain medications and dietary changes which can improve this condition. When the blood flow is disrupted, the free fluids can accumulate in the abdomen. In this case, you will notice visible swelling and the treatment depends on the underlying cause. If you want to prevent further disorders such as ascites formations, you have to act immediately. The typical color or canine gums is pale-pink to pink. However, you can use the color to identify various disorders in dogs. For instance, if your pet’s gums are bluish, then it may indicate he has cyanosis, which means poorly oxygenated blood. The weight loss in manure dogs or inability to grow properly may indicate your pet has CHF. To clear all the doubts, you should take your pooch to the vet. He will perform a detailed analysis and recommend proper medications. In an adult, heart failure is often linked to weight reduction, and muscle loss particularly over the top of the back and around shoulders. Radiographs or X-Rays of the chest can be used to diagnose cardiovascular disorders and evaluate their severity. In this case, the veterinarian can check the heart, its location, size, and shape, as well as lungs. If your pet is suffering from cardiovascular disorders, then fluid can accumulate in the lungs, which can lead to severe consequences. Listening to the heart is the necessary procedure and one of the first steps in diagnosing heart disorders. The vet will use a stethoscope and try to detect heart murmurs. Their locations and intensity will reveal the significance and possible treatment. On top of that, auscultation will assess its rhythm and inspect the lung looking for the changes linked to heart failure. EKG is used to record the electrical activity of the heart. It is a reliable, safe and non-invasive procedure. The vet will place electrodes to the dog’s skin, over the chest and legs. The electrocardiogram is commonly applied to evaluate the heart rate and identify any abnormalities. Additionally, it can also help you determine the enlargement of this organ as well. In addition to irregularity found in x-rays, physical appearance, and EKG, cardiovascular disorders can cause changes in the blood. For example, you may notice a couple of natural substances which level increases when it comes to cardiovascular disease. In that case, pay attention to cardiac Troponin, and NT-proBNP. The blood test will measure the amount of these substances and help you diagnose a specific heart condition. Depending on the case and how severe your pet’s condition is, a decreased amount of sodium will be beneficial for him. In the case of mild heart disorders, only mild sodium restriction should be applied. On the other hand, if your pet is dealing with CHF, then you should eliminate sodium. Talk to your vet and try to find the best solution. You may resort to specialized nutrition to improve your canine’s health condition. Taurine and L-carnitine play significant role in dog nutrition. Taurine is an amino acid, and if deficient it can cause specific cardiovascular disorders. Complete and balanced commercial dog food has enough taurine. However, if a recipe is labeled as limited and supplemental use, then it won’t have sufficient amount of taurine. Additionally, L-carnitine will protect your canine’s heart and keep it healthy. A specific type of omega fatty acids found in fish oil has shown positive results with heart diseases. Compared to humans, omega-3 fatty acids don’t have the same effect. They don’t minimize the symptoms or prevent coronary artery disease. However, canines suffering from CHF may benefit from omega fatty acids in other ways. It will increase their appetite and stop muscle loss. During the metabolic processes, the body produces unstable molecules or so-called free radicals. Even though free radicals are responsible for healthy aging, they can cause a variety of health issues. On the other hand, antioxidants such as vitamin E eliminates free radicals and restores proper body function. In some case, it has been proven chemical imbalance between free radical production and the amount of antioxidant necessary for protection. Therefore, the vet will recommend additional supplementation in the form of vitamin E.
Magnesium is a crucial mineral for canines with chronic heart failure. A deficiency of this mineral can increase the potential side-effects of cardiac medications. Additionally, it will provoke muscle weakness and cardiac arrhythmias. You should monitor your pet’s condition and increase the amount if needed. Same as magnesium, potassium has identical healing properties. However, whether your canine requires nutrition higher or lower in potassium is an individual thing. Again, your vet will need to examine your pet regularly and adjust the diet if necessary. Dogs suffering from cardiac disorders require specialized nutrition. These days, a lot of pet care manufacturers based their meals on specific health condition in canines. Therefore, you should consult your vet and try to decide which recipe will fulfill your dog’s nutritional needs. Additionally, many pet parents love to feed their canines with threats. However, you should be careful, considering they can worsen your dog’s condition. There are plenty of ingredients you should avoid when it comes to a congestive heart disorder. For example, animals with severe heart disease need to avoid sodium completely. On the other hand, reasonable restrictions are only applied to mind heart disorders. Try to find a balance when it comes to a feeding plant. This will help your pet lead a healthy and comfortable life. Focus on delicious food – your pet should be able to enjoy the meal he is eating. If a dog doesn’t consume enough nutrients, then he will probably develop cardiac cachexia. High-quality ingredients – canines with cardiovascular disorders may experience nutrient absorption problem, which leads to a weight loss. So, you want to make sure the food you choose has a decent chance of going through the intestinal wall. Homemade food – they are incredibly delicious and give an owner a chance to control the components. However, you have to be careful how well you combine the ingredients, to avoid nutrient deficiency. What homemade diet food recipes are recommended? Dogs suffering from CHF have special dietary requirements. If you don’t want to use commercial dog meals, then we have one homemade recipe that will awake his taste buds. This meal is quite easy to prepare. Just cook all the ingredient and mix them. Are there low sodium dog treat brands? Yes, there are a lot of brands on the market which develop their food to accommodate the dog’s health issues. For that reason, they pay attention to treats as well. We already listed the Purina Pro Plan recipe as one of the best for CHF. But, did you know they also have an excellent selection of treats, to keep your four-legged friend satisfied? Is wet/canned food recommended than dry food? As long as it contains high-quality ingredients, it’s up to your pet to decide which food he prefers more. There has been a lot of controversy regarding this topic, but it all comes down to components one nutrition has. Congestive heart failure is a severe condition which affects your pet’s body functions, behavior, and performance. The sooner you get familiar with the symptoms, the faster you will start the treatment. However, this disorder doesn’t only affect his health but may disrupt the relationship you two have. So, one of the first you should do is to find the appropriate nutrition. This should be the initial step towards the recovery. We have reviewed a couple of brands, to make this task less challenging. Therefore, we hope your pet approves our choice and leads a long and healthy life. With the premium diet, you will have no issues in minimizing the symptoms, or preventing this disorder.